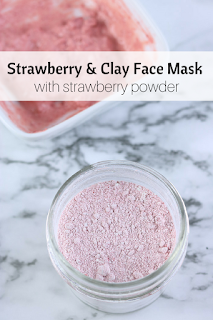 This homemade strawberry and clay face mask recipe is easy to make. The powder will last on the shelf for several months, and you can customize it with different carrier oils and essential oils. A few months ago, I got a sample of a strawberry and clay mask to try. My skin felt amazing after I used it, but when I tried to buy a bottle, it had a pretty big price tag. It also had preservatives and some other unnatural ingredients, so I wanted to try to make my own. I've made strawberry face mask recipes before, but I've always used fresh strawberries. These masks are messy. I really liked the clay that was in this mask, and I thought that adding clay to mashed fresh berries sounded like a big mess. I thought about it for a while and started testing some recipes. I came up with a recipe that worked wonderfully for my skin. You probably don't have the same skin needs as I do, so I'm also going to give you several options to use to make a homemade strawberry and clay face mask recipe that works for your skin type. 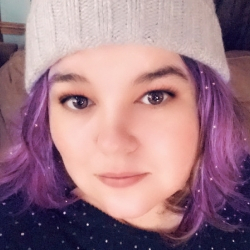 I use a lot of different face masks, and my favorite ones are one that you just add the liquid or are premade. I didn't want to use a preservative in this recipe, so I decided to make a powder and add a liquid when you want to use it. As you read the recipe, you'll notice that you have to add a liquid and the oil when you make the mask. Strawberry powder can go bad if water gets added to it, so I wanted to err on the side of caution and not include the oil with the powder even though the oil shouldn't have water in it. Better safe than sorry. I certainly don't want any of my readers to open up their jar and find mold in it. By making the powder base first and then adding the liquid and carrier oil, this also means that you can make a different mask each time you use it. I'll give you some options for the carrier oils, essential oil, and liquid so you can make a mask that's just for your unique skin needs. Strawberry powder is the star of the show in this recipe. You can buy premade strawberry powder, or you can make it like I did. I found organic freeze fried strawberries at Aldi for about $3 for 1.2 ounces. I used my bullet style blender to grind them into strawberry powder. I used the entire bag and got just under half of a cup of strawberry powder. This is the same strawberry powder that you can buy for $4 an ounce or more online. 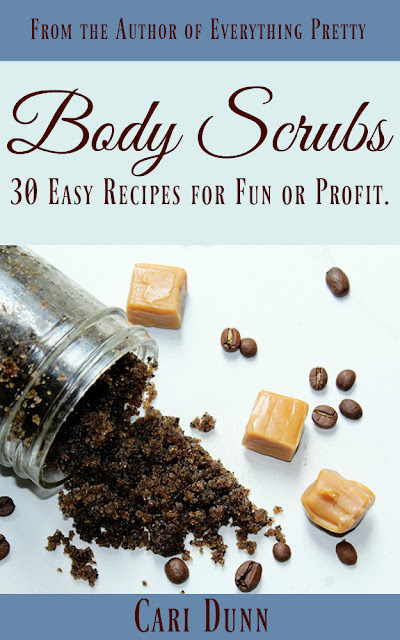 It's great for DIY beauty recipes and cold process soap, but you have to be careful with it. As soon as you add water to it, it's not shelf stable. This means that you have to use a preservative if you use it in a lip balm or any other recipe except cold or hot process soap. Do not use this in melt and pour soap without using a preservative. I've also seen it used in lip balms without a preservative. While I haven't used it in a lip balm, that kind of scares me. Personally, I would never use this in a lip balm without a preservative, even if the lip balm is completely oil based. You get wrinkles and fine lines when collagen production decreases in your body. Strawberries are high in ellagic acid, an antioxidant that helps stop collagen destruction. It also help work to counteract damage from UV light. Strawberries can also help improve acne and blemishes. They are naturally acidic, which can help remove excess oil. Strawberries are high in vitamin C to combat oily skin and nourish your skin. If you have dark spots on your skin, strawberries can help even your skin tone by fading dark spots and can even help reduce acne scars. 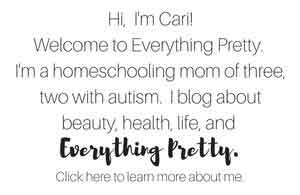 I used kaolin clay for a few reasons. First, I have a lot of kaolin clay. I mean a lot. Someone didn't have room to store it and asked if we could store it in one of our outbuildings. Now I am the proud owner of over 1,000 pounds of kaolin clay. The other reason that I used kaolin is that it's a gentle clay. The strawberries are pretty powerful on their own, so I wanted to use a gentle clay. Kaolin clay helps absorb extra oil and sebum from your skin. It also helps detox by pulling impurities from your skin. Kaolin clay can help exfoliate your skin, so it gently removes dead skin cells for better looking skin. It's the mildest clay, so it's good for even sensitive skin. You can also use bentonite clay , red clay, or green clay. I have not tested this recipe with any clay other than kaolin, but I would't use more than half of another clay in this recipe. Rosewater is naturally anti-inflammatory, so it can reduce puffiness and works well with blemishes. It also helps remove excess oil from your skin, making it good for acne prone skin. Hydrosols are made by distilling plants with water. They aren't as concentrated as essential oils, and you can find them made from some plants that can not be made into essential oils. They have some of the properties of the plant they were made from, so you'll have to choose the one that is right for your skin. Buttermilk is high in lactic acid, which can exfoliate your skin. It's also a natural astringent and can help tighten pores. Aloe water is high in antioxidants and vitamins. It's said to be good for those with acne prone skin. Green tea is another great choice. It's high in antioxidants and tannins. The tannins act like an astringent to clear your pores and reduce oil. The green tea works as the base of the mask. It's high in anti-oxidants, so it can help prevent signs of aging. It's also naturally antibacterial, so it can help reduce blemishes caused by acne. Again, you have a choice in the carrier oil that you use. Jojoba oil is a wonderful product for your skin. Although it's called an oil, it's actually a wax made from the jojoba seeds. The wax is similar to the sebum in your skin, and it dissolves sebum, which can lead to clearer skin. It's a dry oil, so it soaks into your skin quickly. This is a great choice for oily skin. Rose hip seed oil can help firm the skin and improve elasticity. It has essential fatty acids to help soften and smooth your skin. It can also reduce inflammation, redness, and scarring. Use rose hip seed oil if you have fine lines, wrinkles, or dry skin. I used argan oil in my homemade strawberry and clay face mask recipe. It's high in vitamin E and saponins to soften your skin. It helps restore the skin's hydrolipid layer, which can reduce the appearance of fine lines and wrinkles. It's also said to tighten the skin. It's a dry oil, so it's not oily on your skin and soaks in quickly. Argan oil is good for fine lines and toning. Evening primrose oil can make pores appear smaller by dissolving the oil that collects in pores. It's also naturally anti-inflammatory and can reduce redness. The gamma-linoleic acid can help improve skin elasticity and promote cellular turnover. Use evening primrose if you have fine lines or acne prone skin. Avocado oil is high in vitamins A, D, and E. It can help soothe irritated skin and works as a natural anti-inflammatory. It can help combat the signs of aging due to the sterolins in it. Use avocado oil if you have dry skin. Finally, we move on to the essential oils. I used carrot seed oil. It doesn't smell the best, but it works well on my skin. Carrot seed oil is said to help rejuvenate the skin. It helps promote cell regeneration and smooth the skin. It's also said to help face scars, including acne scars. It's full of antioxidants to fight free radicals. Frankincense essential oil is good for most skin types. It's naturally antibacterial and anti-inflammatory, so it's good for acne prone skin. It can help tone the skin the reduce the appearance of pores. It is said to promote new cells, tighten the skin, and fade scars. Geranium essential oil is great for dry skin and acne prone skin. It helps improve elasticity and tighten the skin. It can also help reduce the appearance of fine lines. Lavender essential oil is another oil that is great for most skin types. It's said to help promote cellular turnover, so it's good for aging skin. Rose essential oil is good for dry or mature skin. It is antimocrobial and anti-inflammatory. It can help tone the skin and improve the texture of the skin. Ylang Ylang essential oil can help reduce oil production and reduce blemishes. It's said to help boost cell turnover to smooth fine lines and improve skin elasticity. 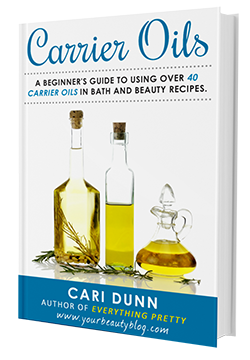 Learn more about different carrier oils and their benefits in my book, Carrier Oils: A beginner's guide to use more than 40 carrier oils. See above for information about selecting the right ingredients for your skin care needs. Before you make this, be sure to read all of the directions carefully or it will not turn out right. Combine the clay and strawberry powder in a 4 ounce mason jar or other container. Mix well. This will be shelf stable, so you can keep it on the shelf until you're ready to use it. When you want to make a mask, combine 2 tablespoons of the strawberry and clay mixture with 1/2 teaspoon oil, 4 drops of essential oil, and 1 tablespoon liquid. Stir well. It will get clumpy, but you can use the back of a spoon to smoosh it to break up the lumps. I've also made this with just the powder and cooled green tea. It works very well. You don't have to add the essential oils and carrier oil for an effective mask. Spread on your face, avoiding the eye area. Let sit for 10-15 minutes. Rinse well. This is a messy mask because it is thick. I usually put it on and then rinse it off in the shower. My skin feels amazing after using this mask! It exfoliates, hydrates, and pulls dirt and oil from your pores. This mask will make your skin turn red for a while after you rinse it off. That's the strawberry powder working. I have semi-sensitive skin and didn't feel any irritation, but I wouldn't use this on sensitive skin. 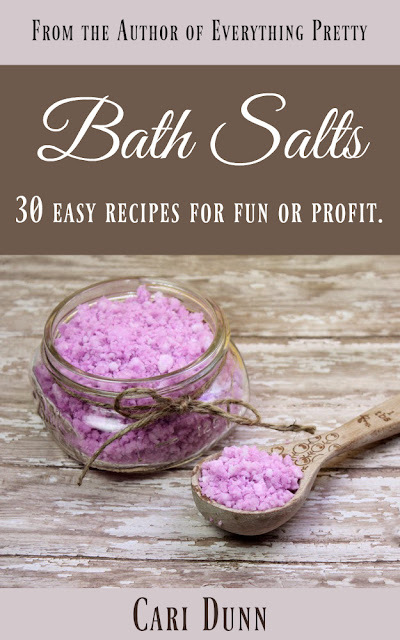 If you didn't read all of this super long post, then you may be wondering why I made a powder and then added the other ingredients. It's so the strawberry powder doesn't get moldy. You can not make this recipe in advance, so always discard any leftovers. For this reason, you should always be careful not to introduce any water to your strawberry and clay powder. Always use a dry measuring spoon to scoop it out, and don't dip wet fingers in the powder mix. I an honestly say that this homemade strawberry and clay face mask recipe is one of the best that I've ever made to soften and hydrate. I have large pores and a very oily T-zone, so my skin needs charcoal and bentonite clay once a week. Let me know in the comments if you try my homemade strawberry and clay face mask recipe.